Palak paneer lasagna is the result of my desire to not waste food. We had some leftover palak paneer from our dinner party, and I thought it would be fun to experiment. I made an Indian-spiced béchamel sauce and combined it with the spinach. The mixture was then sandwiched between layers of pasta sheets. I decided not to add additional cheese since there was already cubes of paneer in the dish. Instead, I crushed herb crackers on top to create a crust. I’ve found that the most unusual dishes are created when your desire to create something new is constrained by the realities of what you have in your pantry or fridge. This dish is a great example. The marriage of Indian ingredients with the pasta really worked well. For the paneer: Heat the canola oil in a pan and fry the cubes of paneer until they are golden brown. Transfer to a paper towel, leaving as much oil as possible in the pan. Set the paneer aside. For the masala sauce: In the same pan, fry the onion in the oil, stirring frequently to prevent the onion from burning, until the color is evenly golden brown. 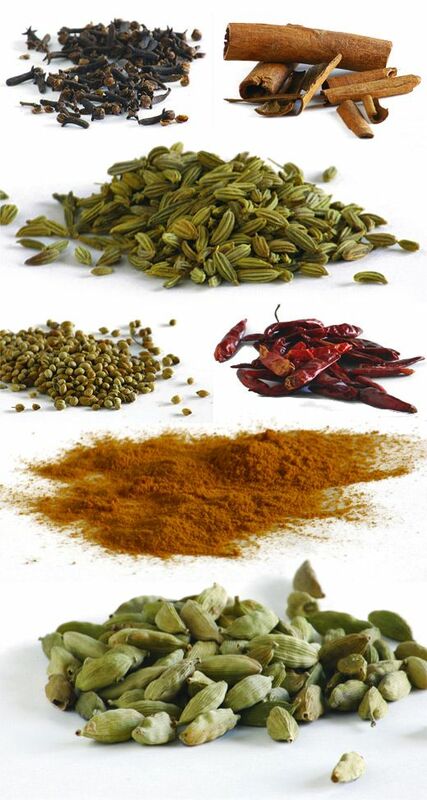 Add 1 teaspoon garam masala and ½ teaspoon turmeric powder. Cook for another 1-2 minutes, then add the yogurt. Transfer to a mini-blender and blend until the sauce is smooth. Add the heavy cream. Set aside. Wash the spinach thoroughly in a large bowl of water. Drain, then remove all the excess water using a salad spinner. Roughly chop all the spinach leaves. In a large pan or wok, add 8 tablespoons of ghee. When it's melted, add the ginger garlic paste. Cook for about 1 minute. Keep the temperature at a high heat. 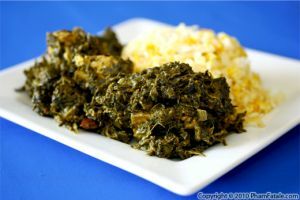 Add 1/3 of the amount of spinach to the pan and constantly lift the spinach leaves using 2 slotted spoons on each side of the pan. The leaves will start to wilt after 30 seconds or so. Add about 1/4 to 1/2 cup of water and the bay leaf, whole long red chiles and Serrano chiles, then add the next 1/3 of the spinach and repeat the same procedure for 30 seconds. Season with a little salt (this will prevent the spinach from changing color). Repeat one more time with the rest of the spinach, then transfer all the content of the pan into a large platter. Reserve the excess spinach liquid in a separate bowl. You can use the liquid to thin the béchamel sauce later if it starts to thicken too much. Add the masala sauce to the spinach. Add sugar and paprika.Cook for 1-2 minutes and add the paneer at the end, along with 1 tablespoon of parsley. Check seasoning and add more salt (if necessary) and pepper. Stir well. Simmer for another 2-3 minutes. Remove and discard the chiles and bay leaf. Set aside. In a saucepan, melt the remaining ghee over medium-low heat; you don't want it to burn. Bring the heat back up to medium-high (the ghee should be hot and golden) and add the flour. Keep stirring manually with a whisk for approximately 3 minutes. The flour should absorb the ghee instantly and form a paste. Add the milk in 3 stages and stir well until fully incorporated. Increase the heat while constantly stirring for about 5 minutes. Reduce the heat to low. Season with salt and pepper. Add the spinach liquid if the sauce is too thick. Add the remaining turmeric and garam masala. 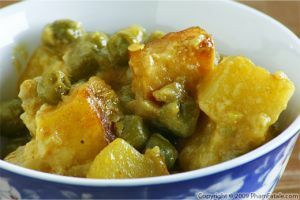 Combine half the amount of the sauce with the palak paneer mixture. Let the rest of the sauce rest until it's time to assemble the dish. In a 14” x 10” x 3” high rectangular pan lined with aluminum foil and sprayed with oil (for easy clean up), spread a layer of caramelized onions first, then layer 4-½ sheets of the lasagna. Spread a layer of palak paneer evenly. Spread about 2 ladles of the béchamel sauce, then add another 4-½ sheets of lasagna. Repeat until all the ingredients are used up. Finish with the rest of the béchamel sauce. It should cover the whole tray; sprinkle with the crushed crackers. Place in the oven for 30 minutes at 375°F (until golden brown). When it's cooked, remove the tray from the oven and let it rest for at least 20 minutes. Cut into squares and garnish with parsley. I am not a fresh-lasagna-sheet fan. I use Barilla brand lasagna. It's already pre-cooked. 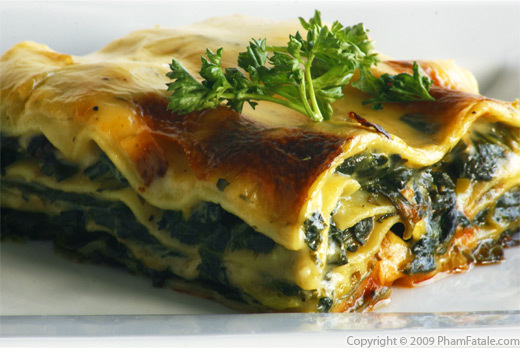 The heat and mioisture of the béchamel sauce will cook and soften the lasagna sheets. I think it's better to control the level of liquid and to produce a denser consistency. There's nothing worse than soggy lasagna. When you use dry pasta, you'll always get good results and you'll also save some time. You can make your own paneer or buy it at your local Indian market. If you don't have any flat-leaf parsley, you can use any other herbs such as cilantro, curly parsley or basil. The secret to good lasagna is the balance of liquid in the dish. I use a slightly thinner béchamel sauce than the traditional one used in Mac n Cheese. The lasagna should come out firm when it's served. 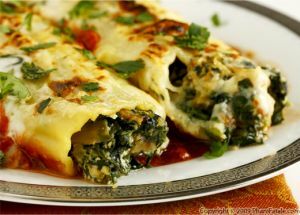 If the excess liquid from the spinach is not removed beforehand, you'll have runny, soggy lasagna. To make béchamel sauce, I always make sure all the ingredients are at the same temperature, so be sure to heat the milk in the microwave for about 2 minutes (or in a saucepan), so it's warm. If you get lumpy pieces in the sauce, don't hesitate to use a hand blender. If you have béchamel sauce left-over, don't discard it. Just store it for later and use it as a sauce for a croque-monsieur sandwich (ham and cheese sandwich). 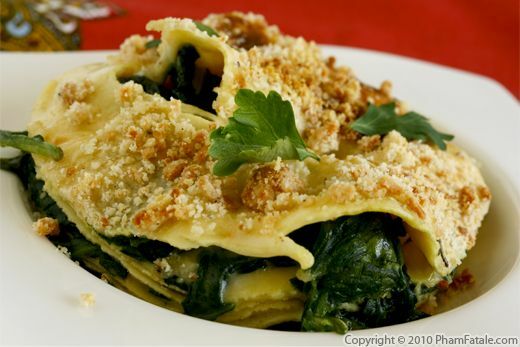 And if you're a pasta lover, check out my other pasta dishes. Published By: Jacqueline Pham on May 25, 2010.